On Sep. 26, 1995, closing arguments began in the O.J. Simpson double murder trial. Approximately nine months had passed since Judge Lance Ito and the jury heard the opening statements of the defense and prosecution. Those nine months — as American Crime Story: The People v O.J. Simpson has labored to show — were a media circus and an exhausting ordeal for everyone involved. As real videos of the closing arguments in the Simpson trial make clear, both groups of counsel had the challenge in their summations of reminding the jury of the evidence and the testimony that supported each of their cases. They also had the task of minimizing their opponents' arguments and of blocking out the background noise that might distract jurors from the actual facts of the case. Like the rest of the trial, the summations given by the defense and the prosecution are not short. 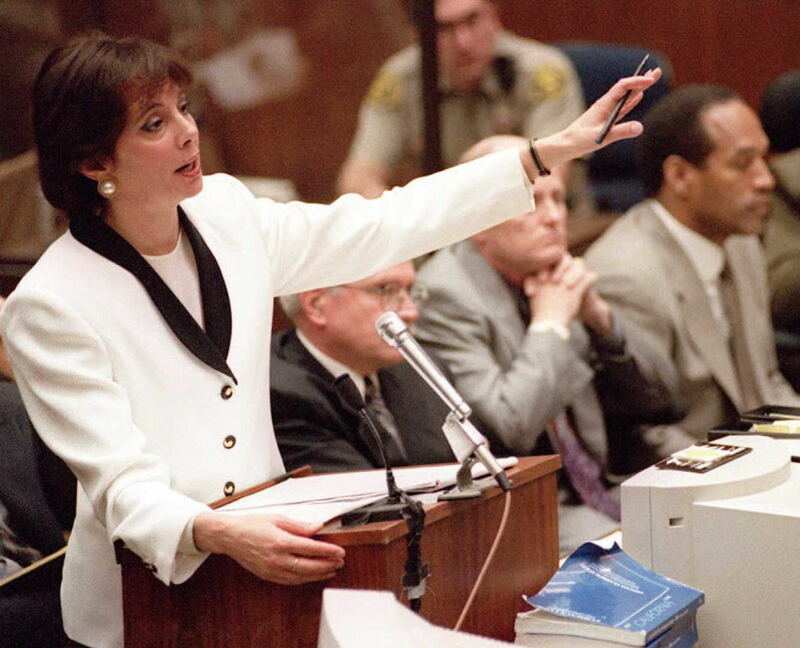 The videos of the closing arguments below show the full 16 hours of summation presented by Marcia Clark, Christopher Darden, Johnnie Cochran, and Barry Scheck. Prosecuting counsel Clark started off the proceedings with her five-hour appeal to the jury. At the time, CNN reported that Clark was "speaking softly, methodically presenting the basic elements of the prosecution's case with a jigsaw puzzle motif." She also thanked the jury for their "selflessness and devotion" before denouncing the racist speech and attitudes of Mark Fuhrman, the LAPD detective who recovered the bloody glove at the crime scene. Clark urged the jurors not to let their emotions about Fuhrman supersede the evidence. Her co-counsel Darden recapped the fraught relationship between Simpson and his ex-wife, Nicole, pointing to past instances of domestic violence as proof that the defendant had significant "anger and rage" towards the victim. "It's all about control, ladies and gentleman," Darden claimed of Simpson's apparent obsession with Nicole's activities and whereabouts. Defense attorney Johnnie Cochran opened his summation with a quote from Frederick Douglass about equal rights and "a common destiny." He hoped aloud that the jury could achieve complete fairness in this case, underlining the defense's strategy to align this verdict with race. Cochran laid the blame for what he claimed was a purposely botched crime scene investigation on the LAPD and brought one of the defense's greatest embarrassments of the trial — asking Simpson to try on the bloody glove — back to haunt them with the repeated soundbite, "If it doesn't fit, you must acquit." Cochran paused his final argument to allow his colleague Barry Scheck to poke holes in the states' blood and other physical evidence. When Cochran returned, he brought the jury's attention back to Mark Fuhrman and the hate speech he employed. The attorney replayed tapes of his comments and compared the officer to Adolf Hitler, suggesting that Fuhrman and other "tainted" cops purposely framed O.J. Simpson. The prosecution had the opportunity to rebut the final arguments of the defense. Clark brought the victims back to the forefront, showing the jurors images of Nicole Brown Simpson and Ronald Goldman's bodies and replaying tapes of Brown Simpson's 911 calls during past instances of battery by her ex-husband. The prosecution called the defense's version of events — that the LAPD framed Simpson — a "conspiracy theory" with little evidence to support such an extreme claim. These closing arguments summarized a long, convoluted, and emotionally-charged trial that still fascinates over 20 years later.